All of us at FAN would like to wish you and all our supporters a very Happy Christmas and holiday season. We would also like to thank you for your generous donations and everything else you have done to stop fluoridation locally and worldwide. Today we bring you a Christmas poem from Italy and a photo from England. And we also received this short note and photo from Cynthia Bagchi from Bedford, UK. I am so very pleased, as you can see, that these two boys and their many friends have not had to drink or bathe in fluoridated water as my own children were when they were young, before I became wiser. I can see the difference. 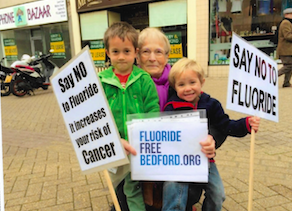 I am just so grateful to you and your team for leading the fluoride free campaign and for giving us all the many ‘tools’ and support , raising the ‘f’ profile so that locally we had more courage and conviction to keep going – for there were times when it nearly did all seem just too much. These two grandchildren of ours that your see in the photo (the eldest one had just been born – two weeks- in 2010 on your first visited to Bedford and was there for most of your talk at the EntShed); these two boys, now 6 years and 4 years have often helped with delivering flyers and as you see were there to help when we had our Big Bedford Town event in 2015. I just love this picture – of course I would. We still are not quite free from this ‘poison’ as we wait, and agitate, for the ‘contract to fluoridate’ to be official terminated. We are very, very close to one of our mini-goals for Christmas Eve. We had a terrific day yesterday: as of 8 am this morning we had received $94,953 from 360 supporters. If we receive another 40 donations today we receive a pledge of $3,000 for reaching 400 donors. With all pledges being doubled until we reach $97,000 that could bring us to our mini-goal of $100,000 by midnight Christmas Eve. PREMIUMS: See the exciting premiums we have available (with photos!) here.